Analysis: This photo of a fisherman allegedly holding a 109-pound shrimp caught in waters off Florida has been circulating since 2010. It has appeared on Facebook, Twitter, various other social sites, and before that on a Spanish-language site claiming that the shrimp was caught in Spain. Before that it was supposedly hooked in Australia. Any number of stories have been made up to "explain" the photo, which is suspect on any number of grounds, not the least of which is that if the critter actually did weigh 109 pounds it would take considerably more effort to hold it at arm's length than we see here (if you don't get what I mean, check out what it looks like when three guys are holding up a 109-pound catfish). How big do shrimp actually get? For that matter, even if a shrimp did grow to be this huge, it wouldn't weigh 109 pounds, or even 50 pounds, or 25, or anywhere close to that. In a PBS News Hour segment about Asian tiger shrimp (Penaeus monodon), an invasive species found in greater and greater numbers in the Gulf of Mexico of late, it was reported that an extra-large specimen "as long as a human forearm" might weigh as much as 11 ounces. To extrapolate, if you double that length — say, if the tiger shrimp measured twice as long as a human forearm — it might weigh 22 ounces, or around a pound-and-a-half. A shrimp three times the length of a human forearm — if such existed — could weigh a little over two pounds. At most. Given that the specimen in our photo looks to be about three feet in length, it's twice the size of any real shrimp ever caught (or would be, if real). In 2006, quite a fuss was made over a 16-inch-long black tiger shrimp caught off the coast of Colombia. In 2014, the Internet went gaga over an 18-inch-long mantis shrimp caught by someone fishing from a dock in Fort Pierce, Florida. Both were said by experts to be of "record size." I've found no reports of any non-prehistoric shrimp larger than those found anywhere on earth, ever. Given all the above, it's a foregone conclusion that the photo was manipulated. Never mind the preposterous weight attributed to the specimen, its physical dimensions betray the image as a hoax. The original snapshot must have shown the subject holding an ordinary fish of some kind. 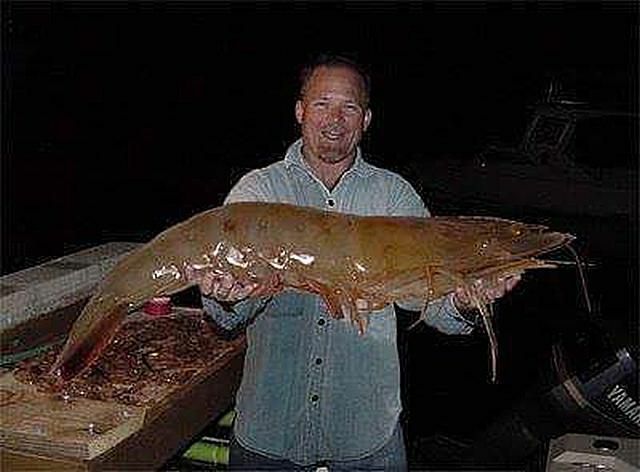 The"109-pound shrimp" was Photoshopped in after the fact, not only giving it an unreal appearance — it looks like the shrimp was cut and pasted in as an afterthought, doesn't it? 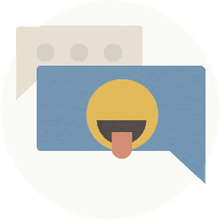 — but degrading the overall quality of the image in the process. In July 2015 a 12-inch tiger shrimp was caught in the St. Johns River in Jacksonville, Florida. Local shrimpers claimed the larger shrimp that are increasingly showing up in Florida were farm-raised in North Carolina and escaped during Hurricane Hugo. In 2012 a foot-long tiger shrimp was caught off the coast of Louisiana. Scientists say the invasive species is on its way to becoming "established" within 10 years and is most likely there to stay. In 2011 a "giant tiger prawn" was caught near Panama City, Florida ("tiger prawn" and "tiger shrimp" seem to be used interchangeably in these media reports). The good news, for humans at any rate, is that they're both harmless and edible.